Description: After the Battle of the Wilderness, Grant’s and Meade’s advance on Richmond by the left flank was stalled at Spotsylvania Court House on May 8. This two-week battle was a series of combats along the Spotsylvania front. The Union attack against the Bloody Angle at dawn, May 12-13, captured nearly a division of Lee’s army and came near to cutting the Confederate army in half. Confederate counterattacks plugged the gap, and fighting continued unabated for nearly 20 hours in what may well have been the most ferociously sustained combat of the Civil War. On May 19, a Confederate attempt to turn the Union right flank at Harris Farm was beaten back with severe casualties. Union generals Sedgwick (VI Corps commander) and Rice were killed. Confederate generals Johnson and Steuart were captured, Daniel and Perrin mortally wounded. 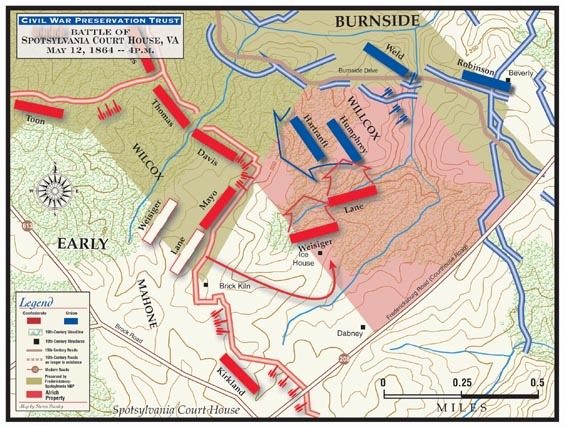 On May 21, Grant disengaged and continued his advance on Richmond. (About) Satellite photograph of the "Bloodiest Landscape in North America." Unprecedented loss of life was witnessed at Fredericksburg, Chancellorsville, Wilderness, and Spotsylvania - more than 85,000 men wounded; 15,000 killed. No place in the United States more vividly reflects the Civil War’s tragic cost. Portions of the Spotsylvania Court House battlefield are now preserved as part of Fredericksburg and Spotsylvania National Military Park. Satellite photograph is courtesy Microsoft Virtual Earth. This map is of the Alrich Tract, the scene of fighting during the Battle of Spotsylvania Court House, May 12, 1864. The property (identified in pink) was the scene of a Union attack on Heth's Salient, a key point in the Confederate lines. However, a successful Confederate flank assault on the Union lines eliminated the threat to Heth's Salient. Aftermath: Lee's tactics had inflicted severe casualties on Grant's army. Moreover, as a consequence, Grant sustained more than 18,000 casualties, of which approximately 3,000 were killed. In two weeks of fighting, Grant had lost a staggering 35,000 men, and an additional 20,000 returned home via enlistment expiration. In fact, Grant at one point on the North Anna had fewer than 65,000 effectives. But Lee did not conclude the series of battles unscathed, either. 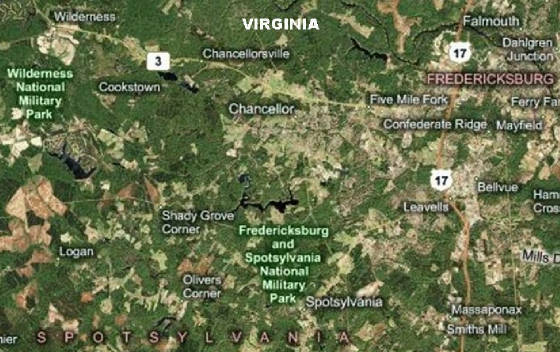 At Spotsylvania, he lost another 10,000 – 13,000 men, and the Confederates had to pull men away from other fronts to reinforce his now severely weakened army. Making matters worse, the army had taken heavy losses among its veteran units and its best officers. This may have saved Grant from a disaster on the North Anna, when his decimated army was positioned badly and was ripe to be attacked. Lee, however, never attacked, because his Army of Northern Virginia was unable to seize the initiative. In fact, Lee's army would never regain said initiative because of the losses it had sustained in those bloody two weeks in May 1864. Recommended Reading: The Battles For Spotsylvania Court House And The Road To Yellow Tavern, May 7-12, 1864. Description: The second volume in Gordon C. Rhea's peerless five-book series on the Civil War's 1864 Overland Campaign abounds with Rhea's signature detail, innovative analysis, and riveting prose. Here Rhea examines the maneuvers and battles from May 7, 1864, when Grant left the Wilderness, through May 12, when his attempt to break Lee's line by frontal assault reached a chilling climax at what is now called the Bloody Angle. Drawing exhaustively upon previously untapped materials, Rhea challenges conventional wisdom about this violent clash of titans to construct the ultimate account of Grant and Lee at Spotsylvania. Continued below. About the Author: Gordon C. Rhea is also the author of The Battle of the Wilderness, May 5–6, 1864; To the North Anna River: Grant and Lee, May 13–25, 1864, winner of the Fletcher Pratt Literary Award; Cold Harbor: Grant and Lee, May 26–June 3, 1864, winner of the Austin Civil War Round Table’s Laney Prize, and Carrying the Flag: The Story of Private Charles Whilden, the Confederacy’s Most Unlikely Hero. He lives in St. Croix, U.S. Virgin Islands, and in Mt. Pleasant, South Carolina, with his wife and two sons. Recommended Reading: To the North Anna River: Grant And Lee, May 13-25, 1864 (Jules and Frances Landry Award Series). Description: With To the North Anna River, the third book in his outstanding five-book series, Gordon C. Rhea continues his spectacular narrative of the initial campaign between Ulysses S. Grant and Robert E. Lee in the spring of 1864. May 13 through 25, a phase oddly ignored by historians, was critical in the clash between the Army of the Potomac and the Army of Northern Virginia. During those thirteen days—an interlude bracketed by horrific battles that riveted the public’s attention—a game of guile and endurance between Grant and Lee escalated to a suspenseful draw on Virginia’s North Anna River. Continued below. From the bloodstained fields of the Mule Shoe to the North Anna River, with Meadow Bridge, Myers Hill, Harris Farm, Jericho Mills, Ox Ford, and Doswell Farm in between, grueling night marches, desperate attacks, and thundering cavalry charges became the norm for both Grant’s and Lee’s men. But the real story of May 13–25 lay in the two generals’ efforts to outfox each other, and Rhea charts their every step and misstep. Realizing that his bludgeoning tactics at the Bloody Angle were ineffective, Grant resorted to a fast-paced assault on Lee’s vulnerable points. Lee, outnumbered two to one, abandoned the offensive and concentrated on anticipating Grant’s maneuvers and shifting quickly enough to repel them. It was an amazingly equal match of wits that produced a gripping, high-stakes bout of warfare—a test, ultimately, of improvisation for Lee and of perseverance for Grant. About the Author: John Cannan has established a reputation among Civil War writers in a remarkably short time. His distinctions include three books selected by the Military Book Club. He is the author of The Atlanta Campaign, The Wilderness Campaign, and The Spotsylvania Campaign. Cannan is an historic preservation attorney residing in Baltimore. Recommended Reading: If It Takes All Summer: The Battle of Spotsylvania (Hardcover). Description: The termination of the war and the fate of the Union hung in the balance in May of 1864 as Robert E. Lee's Army of Northern Virginia and Ulysses S. Grant's Army of the Potomac clashed in the Virginia countryside—first in the battle of the Wilderness, where the Federal army sustained greater losses than at Chancellorsville, and then further south in the vicinity of Spotsylvania Courthouse, where Grant sought to cut Lee's troops off from the Confederate capital of Richmond. This is the first book-length examination of the pivotal Spotsylvania campaign of 7-21 May. Continued below. Drawing on extensive research in manuscript collections across the country and an exhaustive reading of the available literature, William Matter sets the strategic stage for the campaign before turning to a detailed description of tactical movements. He offers abundant fresh material on race from the Wilderness to Spotsylvania, the role of Federal and Confederate cavalry, Emory Upton's brilliantly conceived Union assault on 10 May, and the bitter clash on 19 May at the Harris farm. Throughout the book, Matter assesses each side's successes, failures, and lost opportunities and sketches portraits of the principal commanders. The centerpiece of the narrative is a meticulous and dramatic treatment of the horrific encounter in the salient that formed the Confederate center on 12 May. There the campaign reached its crisis, as soldiers waged perhaps the longest and most desperate fight of the entire war for possession of the Bloody Angle—a fight so savage that trees were literally shot to pieces by musket fire. Matter's sure command of a mass of often-conflicting testimony enables him to present by far the clearest account to date of this immensely complex phase of the battle. Rigorously researched, effectively presented, and well supported by maps, this book is a model tactical study that accords long overdue attention to the Spotsylvania campaign. It will quickly take its place in the front rank of military studies of the Civil War. Recommended Reading: Trench Warfare under Grant and Lee: Field Fortifications in the Overland Campaign (Civil War America) (Hardcover). Description: In the study of field fortifications in the Civil War that began with Field Armies and Fortifications in the Civil War, Hess turns to the 1864 Overland campaign to cover battles from the Wilderness to Cold Harbor. Drawing on meticulous research in primary sources and careful examination of trench remnants at the Wilderness, Spotsylvania, North Anna, Cold Harbor, and Bermuda Hundred, Hess describes Union and Confederate earthworks and how Grant and Lee used them in this new era of field entrenchments. Sources: National Park Service; Photograph courtesy Library of Congress; Bonekemper, Edward H., III, A Victor, Not a Butcher: Ulysses S. Grant's Overlooked Military Genius, Regnery, 2004; Eicher, David J., The Longest Night: A Military History of the Civil War, Simon & Schuster, 2001; Esposito, Vincent J., West Point Atlas of American Wars, Frederick A. Praeger, 1959. Reprinted by Henry Holt & Co., 1995; Fox, William F., Regimental Losses in the American Civil War, reprinted by Morningside Bookshop, Dayton, Ohio, 1993; McPherson, James M., Battle Cry of Freedom: The Civil War Era (Oxford History of the United States), Oxford University Press, 1988; Smith, Jean Edward, Grant, Simon and Shuster, 2001; U.S. War Department, The War of the Rebellion: a Compilation of the Official Records of the Union and Confederate Armies, U.S. Government Printing Office, 1880–1901; Civil War Preservation Trust; Microsoft Virtual Earth.